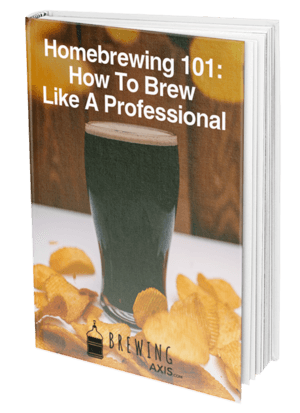 If you want to get started as a brewer, there are a few things that you’re going to need, some of which are tangible and others which are not. For example, if you want to brew the best beer, then you’re going to need an understanding of the process. Much like a math problem, understanding why something happens in brewing is crucial to breaking things down. Once you feel that you’re comfortable with the knowledge that forms the foundation of a brewer’s skills, then you’ll need the right equipment. While it’s true that pots and fermenters won’t make you the best brewer in the world overnight, quality implements can go a long way in helping you refine and improve your skills. One of the most crucial things a brewer will need is a brew kettle, which will be used to boil the wort or extract before it goes into the fermenter. There are very few recipes which don’t call for a brew kettle (those using pre-hopped extract are the most common), so you’ll want the best brew kettle possible. 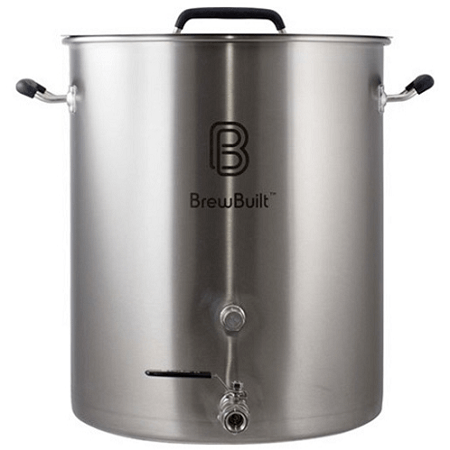 Today, we're going to review the BrewBuild 15-Gallon Brew Kettle. However, before we get to the details of that product, we're going to discuss some of the most essential things to search for when buying your new brew pot. Many brew kettles come equipped with a valve so that you can recover your boiled wort afterward without having to filter or strain it from the top. When choosing the best option, you'll want to look at the position of the valve, as that will determine how much of your wort will be recoverable. A valve positioned higher up on a kettle will leave a higher volume of liquid that can't flow through it. The quality of the valve is also critical, so consider the material that it's made out of and the design of it as well. Many of the best brew kettles will feature stainless steel ball valves due to their reliability. You should also take a look at the cover before you decide on the right brew kettle, as they can affect the quality of your boil. 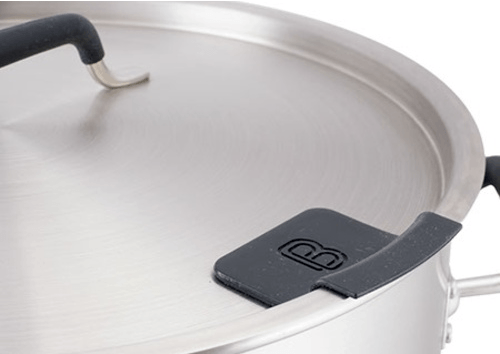 For example, a vented lid will tend to allow more steam to escape, which will help reduce the amount of water in the kettle, making boil overs a little less frequent, especially for smaller pots. Consider the type of handle that's mounted on the lid of a brew kettle, as welded ones will be more prone to failure. There are also many different materials that the grip can be made of; the best are synthetics which won't absorb as much of the heat from the pot, preventing burns. 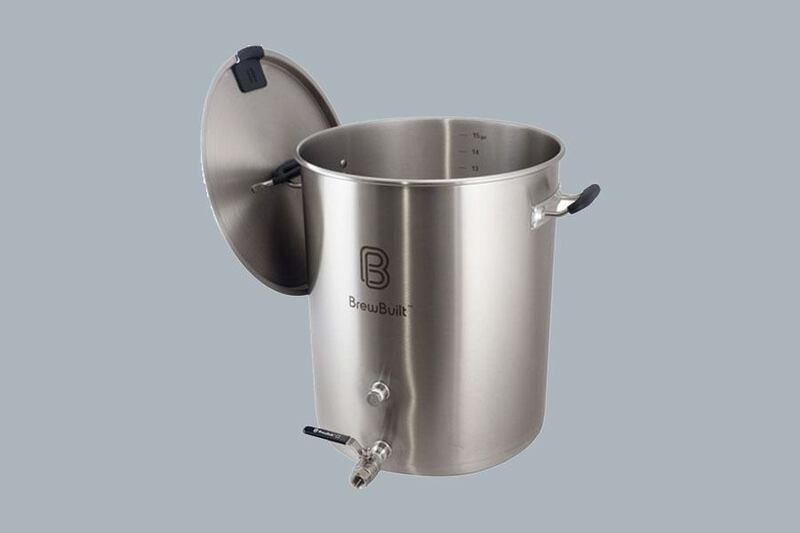 This BrewBuilt brew kettle is excellent for a wide range of brews ranging from small to large thanks to its 15-gallon capacity and high sides which will help stop boil overs. This is a high-quality model which features excellent construction and quite a few extra features. The first thing you’ll notice about this brew kettle is its solid construction. Made of high-quality stainless steel, this pot will last a long time and will be able to resist the corrosive effects of acidic wort. The riveted handles with silicone grips provide a mix of reliability and comfort due to their low thermal conductivity. The lack of welds on this pot ensures that you can use it repeatedly without having to worry about any points that will be vulnerable to failure. The stainless steel ball valve is another reliable part of this brew kettle, ensuring that your recovery process will remain smooth for as long as you have the pot. The bottom of this pot features a core that’s made of aluminum in between the tri-clad layers which allows it to heat up much faster than the competition. As you would imagine, these three layers will also ensure that your wort won’t scorch, making it an excellent choice for working with grain. Equipped with two coupler points, you'll also be able to fit this pot with anything you need, and their standard 0.5" size ensures that you can use any accessories you have left from old kettles. You'll also find that the lid of this kettle is notched so that you can use sparge arms or similar tools. To give you a better idea of how this kettle will perform if you decide to order it, we’re going to cover what customers had to say over the course of their own reviews. Starting with the positives, buyers mentioned that the BrewBuilt kettle was built to much higher standards than much of the competition. The stainless steel construction and the riveted handles played a large part in this product’s superior results in this area. The tri-ply bottom and the aluminum core were also the subjects of praise. Customers also had some critiques about this brew kettle, namely the lack of included attachments considering the relatively high price. Many reviewers would have expected at least a thermometer to come with this brew kettle, and we're inclined to agree that it would have lessened the blow of this model's price tag. While this BrewBuilt kettle may be a little more expensive than some of the other models out there, we would argue that the higher cost is justified thanks to the build quality and extra features. You can typically find this product available for around 250 dollars. 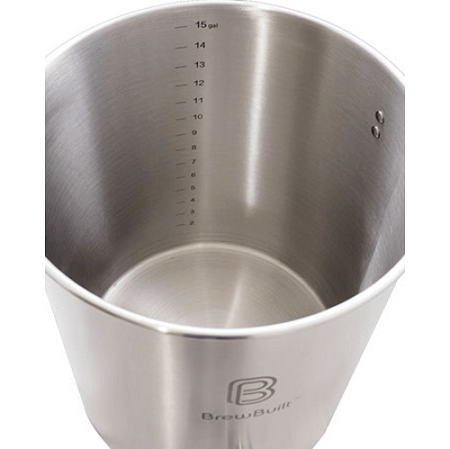 For those of you who are willing to spend extra on an excellent brew kettle, the BrewBuilt 15-Gallon Brew Kettle is one of the best options out there. Thank you for taking the time to read through our review and feel free to leave us a comment or a question down below.